10% discount on Your Case Purshace with Code SAVETEN! 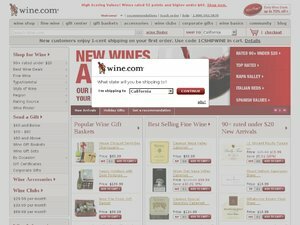 Do not miss another wine.com voucher! Simply leave your e-mail address and we'll always keep you informed of new vouchers for wine.com. 10% discount, spend 6 or More Bottles with Code APRIL6 at Wine.com! Valid 4/2/18 - 4/4/18! 10% discount on a Case Purchase with Code FEBSAVE10 (Ends 2/27)! Latest voucher code valid at a time of promo publication was entered to be working from 2019-04-11.